The fifth annual ACS Pacesetters awards was inundated with applicants, a lunch heard before presentation of the awards to members of the SIA-approved contractor group. David Mountford of FM Contract Watch, the compere of the lunch at Windsor racecourse yesterday, said it was very difficult to choose a shortlist; some 60 individual entries had to be narrowed down to 12 (eventually increased to 14) awards. The charity for the day chosen by Lynda Moore at ACS Pacesetters was Veterans in Action. Billy MacLeod, himself a veteran, described how VIA seeks to help veterans of conflict by outdoor activities, such as walking; and in September and October it’s running an expedition to Greece and back. Pictured left to right are Lynne and Billy with cheque for the £1160 raised by diners from a raffle, with prizes donated by FM Contract Watch, Ward Security, Man Commercial Protection, Royal Windsor race course, Westgrove Support Services and Broadstone Engage. Before and after lunch speakers were Paul Barnard, the former senior City of London Police detective now of Ward Security, who stepped in to replace Paul ‘Tug’ Hartley GM who was unable to attend; and Rick Mounfield, chief exec of the Security Institute, respectively. Earlier, guests enjoyed warm sunshine and drinks sponsored by First Response Group. Security officer of distinction awards went to Wala Asikandambo (Interr Security), Justin Attwood (Wilson James), Kathy Aymer (CIS Security), Waseem Azam (SSG Support Services Group), Robert Delaney (Lands Sheriff), Scott Forsyth and Aminul Chowdhury (Axis Security Services), Eliana Hague (Sodexo), Gordon Hewitt and James Gemell (Ward Security), Robert Metcalfe (The Protector Group), Allan Morris (MAN Commercial Protection), Alan Parkes and Lianne Doran (Westgrove Support Services), and Ryan Weeden (ABM Group UK). Company presentations went to (given by sponsors, in brackets): (Mike Bolt of Sutton Specialist Risks) ABM Group (UK), CIS Security, First Response Group and Servest Security Services; (Tracktik), APCOA Parking (UK), Interr Security, TC Facilities Management and Wilson James; (David Callaghan, the new CEO of Centralus plc), Exclusec Security Solutions, Oakpark Security Systems, Sodexo and Ward Security; (James Doyle of Broadstone Engage), Axis Security Services, Lodge Security, The Keyholding Company and Unitrust Protection Services (UK); (Kevin Riley of Eurotech Monitoring), MAN Commercial Protection; SSG Support Services Group; Venture Security Management; and Westgrove Support Services; (Experian), Classic Security (UK), Land Sheriffs, Shield Security Services and The Protector Group. 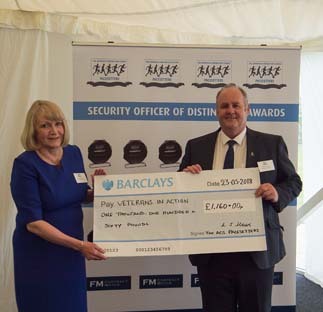 Membership is made up of contract guarding companies who are in the top 15 per cent by benchmarking and achievement levels set by the Security Industry Authority’s approved contractor scheme; meaning that about 125 companies are eligible to join. Visit https://www.acspacesetters.co.uk/.